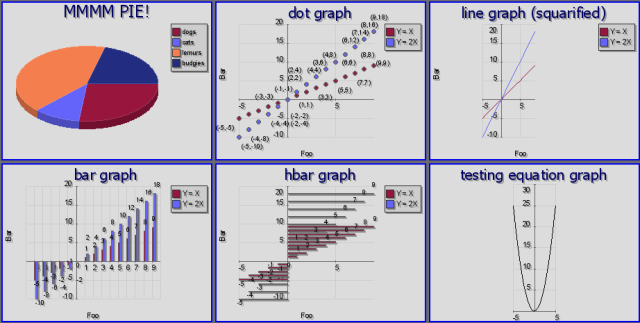 Multigraph aims to provide an efficient, pleasing-to-look at method for producing dot, line, bar and pie charts from given datasets. The class can be invoked through the command line or as an object which creates its own url to be used in an HTML img tag. Please note that you need some Truetype font files for this class to work. Whilst you may use any Truetype font you please, for the default configuration to work, you need arial.ttf and tahoma.ttf, which are available for free from Microsoft. Use this page to get hold of the Microsoft Truetype fonts, which are freely available. You only need these if you are not going to change the default fonts used by the class.